This is a mid-sized unit, measuring just over 2 meters high, wide and deep. It weighs in at 100kg. Like all Marcy home gyms, it looks impressive. It comes in black / grey, and you don’t get a choice of finishes. Some assembly is required (as with all home gym units). Construction is tubular steel, and a secure saw-tooth locking system is in use. The central component is the Smith Machine. The bar can take both Olympic (2 inch) and standard 1-inch weights. Those weights are not included in this package. If you do use amazon, it makes sense to buy the weights at the same time. Some lucky delivery person gets to bring them to you (free delivery), saving a lot of trouble! You’ll find a solid base, which touches the floor at multiple points – giving you a stable unit. The max user weight is just over 21 stone. I would recommend you think about the flooring before you choose your Smith Machine… this can be a hassle afterwards. This unit is very versatile. Key here is the removeable (and fully adjustable) bench. Remove it and you can use the Smith Machine for squats and more. Presses are in play with the bench back in place, and leg curls too. The lat pulldown comes with a bar and single hand extension – giving you versatility here too. There is a full list of exercises, which has been divided into chest / shoulders, back / biceps / triceps and legs / abs. As with all except the ‘bargain basement’ home gym units, there is only a small amount of feedback to go on. This is positive (at the time of writing this) with 4.5 stars out of a possible 5. One commenter, said that he was happy with this machine after 3 years of regularly attending a commercial gym. Construction, which is often a sticking point, also came in for some praise – or at least a note that this was easy. Marcy are known for their service (as well as their solid equipment). It seems nobody had a need to return / change this unit… though based on other Marcy items, I would not have any worries there. This is an impressive and versatile unit. 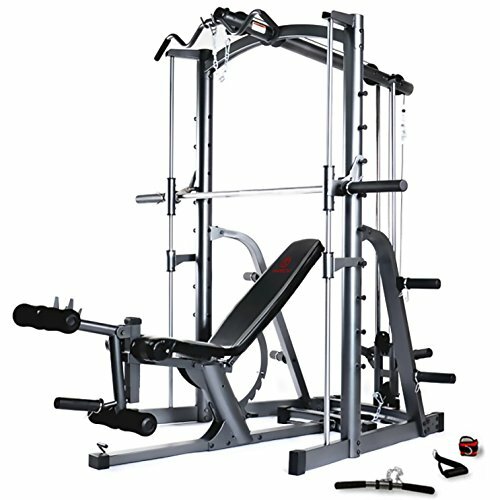 It is mid-sized compared to other home Smith Machines, and mid-priced. You will need to pick up weights separately, and some assembly time needs to be set aside. With free delivery, and the quality you’d expect from the Marcy brand, I can see this being a popular option for people seeking a nicely priced safe home gym. Check out the impressive gallery over on the amazon.co.uk product page now!